Dry air and cold weather are hard on a person’s skin. Some of the most damaged skin can be found under the main foundation that carries you throughout the day — that being the bottom of your feet. 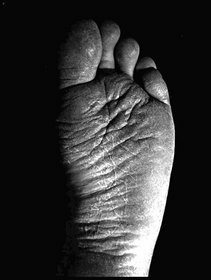 Treating dry or cracked feet is even more critical if you happen to be Diabetic. With a possible lessened sense of feel in your lower extremities, unnoticed injury or infection can quickly lead to more severe foot care problems — including surgery and even amputation. When you have dry feet or cracked feet, bleeding and open sores will be hard to heal due to the constant flexing of the cracks when you walk. The importance of personal foot care and treating dry feet or cracked feet cannot be over emphasized. An application of a good quality moisturizing cream will nourish your dry feet. Applied before bed, or after your shower, it will help retain moisture by sealing out the dry air that allows natural moisture to evaporate. Making use of devices designed to remove dead cracked skin will increase the effectiveness of moisturizers. The Ped Egg is a handheld file that allows you to shave down dead skin while retaining the removed particles within the egg for easy and clean disposal. This NBC Video on the Ped Egg gives pretty dramatic proof that the Ped Egg does what it claims to do very well. In your efforts to keep your feet moist, be sure to avoid fungal infections such as athletes foot. By keeping your feet too moist, you could create the same situation. An application of petroleum jelly followed by wearing a pair of socks to bed (or in the case of your hands, a pair of gloves), will quickly soften dry feet, cracked feet or dry skin. It will seal in the natural moisture while softening your dry feet. Regular bathing (allows dead skin to be washed away). Toenail care (after a shower the nails are more pliable and can be clipped without cracking or injury to surrounding skin).